Well, anyone who's bothered to stick around with me for 2017 knows that this definitely wasn't my year for blogging. Guys.... mommin' ain't easy. And it's not really mommin' that's tough, but when I get time to sit down and have an hour to myself, the last thing I want to do after working all day, or cooking dinner, or running errands, is prop open my computer. I want to pick up a book or catch up on a TV show. But believe me when I say my brain is hopping with blog ideas, and I'd like to get back in the swing in 2018, but I know better than to make any firm promises. All I can really say is to follow me on Instagram for beauty stories, photos, quick reviews, life stuff etc. because that's the more feasible, less time-consuming option these days. Despite my miserable attempt at maintaining this blog, I have been pondering over my 2017 favorites for quite some time now, and thanks to a handy dandy fancy new lightbox from my husband for Christmas (bear with me... I'm still learning the best ways to use it! ), I was able to take photos at a weird time in my dark house and get this post out to you! 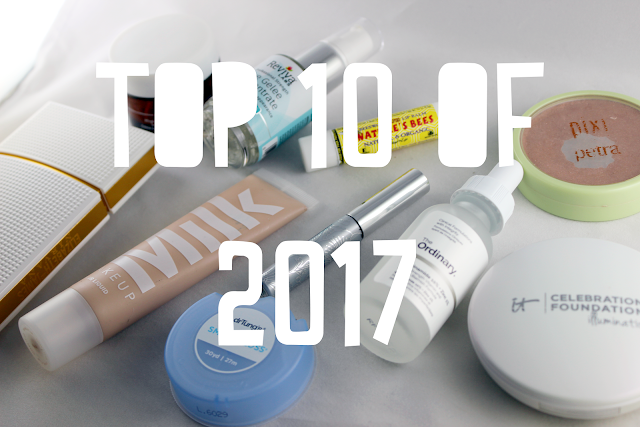 I'm really excited to share these ten products because they've honestly been game changers for me. Some of these things I've loved longer than this year, but my true devotion was cemented within 2017, and some of these things are new to me completely. I hope you enjoy this post and find some new products to love, too - and please share with me what YOU loved this year in the comments below... starting tomorrow I'm taking recommendations for potential 2018 favorites. It Cosmetics Celebration Foundation Illumination - Based on a recommendation from one of Thataylaa's videos, I gave this powder foundation a shot and it has rocked my world. I don't use it as my primary foundation, but I use it to set my foundation everywhere but my under eyes and my forehead (it cakes under my eyes and makes my forehead look greasy). It has a very, very subtle radiant glow and it adds a bit of coverage, but most importantly it makes my skin look flawless. Now, this product will set you back a bit, ringing in at $35 for 0.3 oz, but if you use it as I do, you'll get months of use out of it. I have yet to hit pan on my first compact and I've been using it for over five months. This is now a staple in my beauty routine and I don't see that changing any time soon. Pixi Beauty Bronzer in Subtly Suntouched - I've loved this bronzer for quite some time now (you may recall seeing it here in the past) but it's become my number one favorite this past year. I use it almost every single day and it's absolutely perfect for a subtle contour or glow. It provides a delicate radiance without being shimmery or glittery, which gives a healthy-looking glow and makes me appear less "my kid is zapping all my energy" zombie-tired-looking. I think this is a fantastic bronzer, especially if you're as fair-skinned as I am, and an added bonus is that you can easily pick it up at Target. Clinique Bottom Lash Mascara - I haven't talked much about this, but it has shown up in some empties posts this past year. I'll admit, this is not a necessary product, but I adore it and won't be without it. If you're one of those unlucky few whose mascara smudges all over your undereye, you need this product. It doesn't smudge, flake, smear, or wear away. The brush is also really tiny so it's easy to apply. One tube costs $11 and it lasts me at least 3 months, and despite that it's not 100% necessary, I'll still keep buying it because I love it. Reviva Labs Eye Gelee Concentrate - Forever I am looking for a miracle for the fine lines that accentuate my blah undereye area. This is, by no means, a miracle, but it definitely helps keep that delicate area hydrated and more plump. I use this underneath an eye cream and I've seen a noticeable difference. It's darn cheap, so if you struggle with dry, lined undereyes, it's worth giving this a try. Origins High Potency Night-a-Mins - I'm a habitual "trier". I skip around from one thing to the next in my skincare because I like to try new things and I'm always hunting for the next best thing. This night cream stuck out to me, though, and is something I want to use again and again. It's so luxurious, and it literally melts in to your skin for a burst of hydration and a remedy for uneven texture and dullness. I will definitely work my way through more jars of this stuff in 2018. Nature's Bees lip balm - Those of you that know me, know I love my lip balms and lip sticks, so you know it's serious when I say I would gladly throw out every chapstick I own and only use this for the rest of my life. It is perfection. It has a lightly cooling minty flavor (and smell), it actually hydrates my lips, and I can actually feel it healing my lips when they're chapped or dry. The only place I've ever seen this in stores is at Big Lots, but I did find them online and you better believe a bulk order is happening soon. Dr. Tung's Smart Floss - Is it weird to include a floss in my yearly favorites? Well, I don't care what your answer is, because this stuff is amazing and oral health is part of beauty in my book. This floss gently puffs up as you work your way through, getting any yucky stuff trapped between your teeth or in your gums out. Simply put, it's fantastic. Make your New Year's resolution to floss more, and pick this up on Amazon or a local natural health retailer. Elizabeth and James Nirvana White - At this point, I've used this fragrance for years. I've even written about it here before. But when I think back on my most-loved fragrances of the year, this one comes to mind. I used it frequently, sometimes alone, sometimes mixed with other Nirvana iterations, and I never once got sick of it. I'm not excellent at describing fragrances, but I'd say this is a preppy, musky, floral scent. It's great for summertime, but I wear it year round because I love it that much. You can find this at Sephora in a variety of sizes (and price points). The Ordinary Niacinamide 10% + Zinc 1% - I think 2017 was the year for The Ordinary. Word slowly crept around that you could get quality skincare (serums, toners, moisturizers, etc.) for a fraction of what you'd normally pay, and boom - suddenly The Ordinary was on the map. I hopped on the bandwagon, too, ordering a few products without expecting too much. I ended up falling in love with this Niacinamide and Zinc serum. With just one use, it visibly reduced the appearance of blemishes on my skin. I've been using it daily for a couple months now and swear by it. I've got backups in my stash for when this bottle runs out and I'm not afraid to use them! You can order this from the Deciem website, but The Ordinary recently became available online on Sephora.com, too. Milk Makeup Blur Liquid Matte Foundation - I don't recall exactly where I heard about this, but when the Sephora VIB sale rolled around, this was on my list to try. It's a bit pricey, a whopping $40 for a foundation, but holy buckets, you guys... this is one of the best high-end foundations I've tried. It makes my skin look smooth and flawless and it lasts all day long. I kind of can't believe how good my skin looks even at 5 PM when I've been wearing it for a nearly 12 hours. If you're a dry or normal-skinned gal, don't let the "matte" in the name scare you; my skin is normal to combo and it looks just the right amount of dewy when wearing this foundation. Even though it hurts my wallet to say it, I always want to have a bottle of this in my drawer. And that's a wrap on my 2017 favorites. I look forward to more beauty fun in 2018 and hope you'll stay with me for the ride! Let me know if you've tried any of these products in the comments below, or if you have any recommendations, share those with me as well!